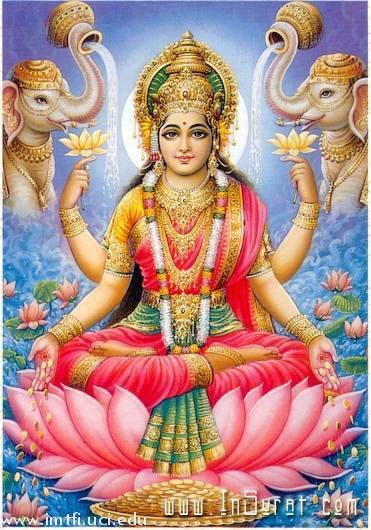 Salutations again and again to the Devi (Goddess Lakshmi) who abides in all beings in the form of good fortune. Shankha Chakra Gadaa Haste Mahaalakshmi Namostu Te. O Mahaamaaya, abode of fortune, worshipped by the Gods, I salute Thee. O Mahaalakshmi, one who has conch, disc and mace in Her hands, obeisance to Thee. Sarva Paapa Hare Devi, Mahaalakshmi Namostu Te. My salutations to Thee, who rides Garuda and are a terror to demon Kola; O Devi Mahaalakshmi, remover of all miseries, my obeisance to Thee. Sarva Duhkha Hare Devi Mahaalakshmi Namostu Te. O Devi Mahaalaksmi, who is the embodiment of knowledge, giver of all boons, a terror to all the wicked, remover of all sorrows, obeisance to Thee. 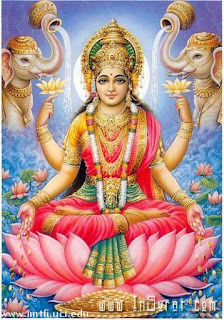 Mantra Moorthe Sadaa Devi Mahaa Lakshmi Namostu Te. O Devi, You give success, intelligence, worldly enjoyment, and liberation. Thou hast always the mystic symbols (Mantra) as Thy form, O Mahaalakshmi, obeisance to Thee. Yogaje Yogasambhoote Mahaalakshmi Namostu Te. O Devi, Maheshwari, You are without a beginning or an end , You are the Primeval energy, You are the greatest ruler, You are born of Yoga. O Mahaalakshmi, obeisance to Thee. Mahaa Paapa Harey Devi Mahaalakshmi Namostu Te. O Mahaalakshmi, You are both gross and subtle, most terrible (for the wicked), You are the embodiment of great power and prosperity and You are remover of all sins, obeisance to Thee. Paramesi Jaganmaata, Mahalakshmi Namostu Te. O Devi, You are seated on the lotus, You are the Supreme Brahman, You are the great Lord and Mother of the universe, O Mahaalakshmi, obeisance to Thee. O Devi, You are dressed in white garments and decked with various kinds of ornaments, Thou art the mother of the universe and its support, O Mahaalakshmi, obeisance to Thee. Mahaalakshmyashtaka Stottram Yad Pated Bhaktiman Naraha. Whoever with devotion reads this hymn to Mahaalakshmi composed in eight stanzas, attains all success through the Grace of Mahaalaksmi. Whoever reads this hymn at least once a day will have all their sins destroyed; those who recite it twice will be blessed with wealth and prosperity. Those who recite this three times in a day will have all their enemies destroyed. They will be always be blessed by the Goddess Mahalakshmi. I bow down to the Tulsi at whose base are all the holy places, at whose top reside all deities and on whose middle are all the Vedas.